With Goldman the latest big bank to miss expectations on the closely watched FICC revenue line, that makes it 4 out of 4 big banks that have failed to hit consensus expectations for this all important segment. The good news, for Goldman and the first reporting quarter for its new CEO, is that all other segments performed well, and with Wall Street expecting Goldman to report $7.54BN in revenue, the world's biggest FDIC-backed hedge fund surprised to the upside, with Q4 net revenue of $8.08BN, a 3.1% increase compared to Q4 2017. The bottom line also beat solidly, with Goldman reporting adjusted EPS of $4.83, above the $4.53 expected, with Bloomberg noting something remarkable: the firm got almost half a billion dollars in income tax tax benefits of $467 million from the Trump tax cut in the final quarter alone providing the bank with an "enormous boost." As a result, in 2018, Goldman paid an effective tax rate of 16.2%, although looking ahead Goldman expects a tax rate this year of about 22 or 23% . Going back to the top line, first the good news: Investment Banking revenue of $2.04BN was better than the $1.93BN expected, as was Equity Sales and Trading, which came at $1.60BN, above the $1.57BN estimate. Prop trading (i.e. investing and lending) also reported a strong number, coming in at $1.9BN, well above the $1.66BN year ago. 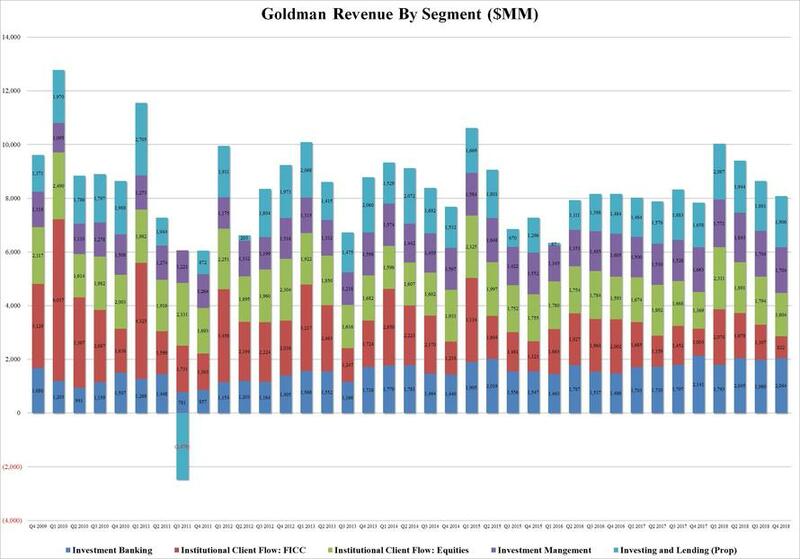 And now the bad news: Goldman's FICC revenue plunged 18% Y/Y, dropping to just $822MM - missing expectations of $976.3MM - and the lowest number for what is traditionally Goldman's most profitable segment since the financial crisis! 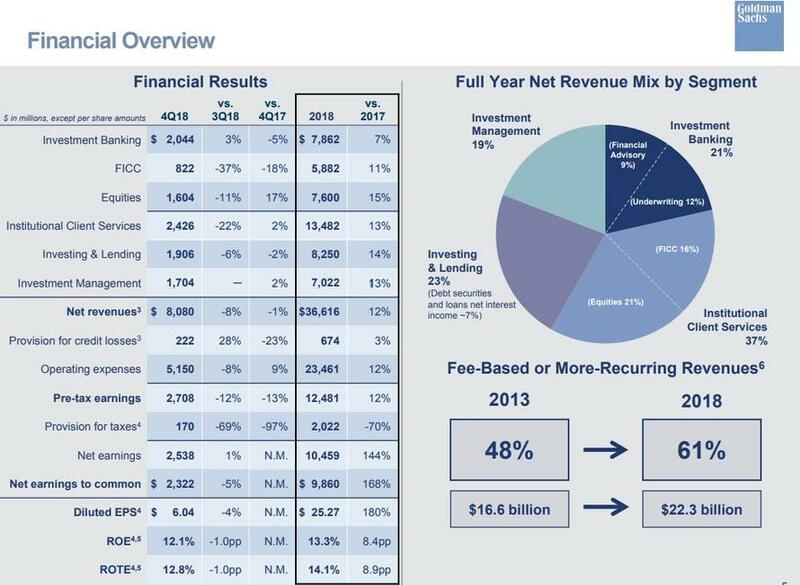 Commenting on the shockingly bad FICC number, Goldman said that 4Q18 net revenues decreased YoY "reflecting significantly lower net revenues in credit products, amid wider credit spreads and increased volatility, and lower net revenues in interest rate products." And while the bank said the trouble in FICC came from significantly lower revenues in credit products and lower revenues in interest rate products, its commodities, currencies and mortgage trading revenues were essentially unchanged. Additionally, in a new breakdown, GS noted that 10% of the FICC revenue mix came from financing and 90% was from market intermediation. 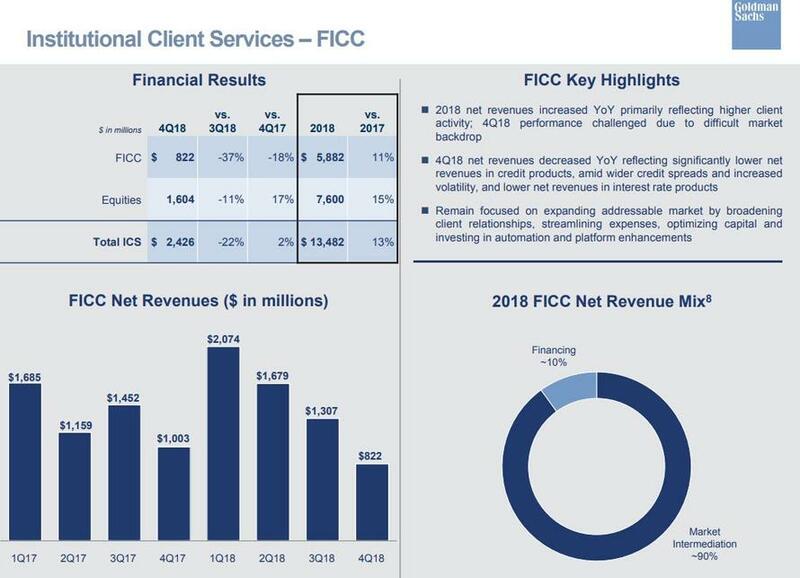 Yet the big drop in FICC was more than offset by strong Investment Banking revenue, which posted $2.044BN in Q4 revenue, down 5% Y/Y, but a solid outperformer in an otherwise dreary quarter. 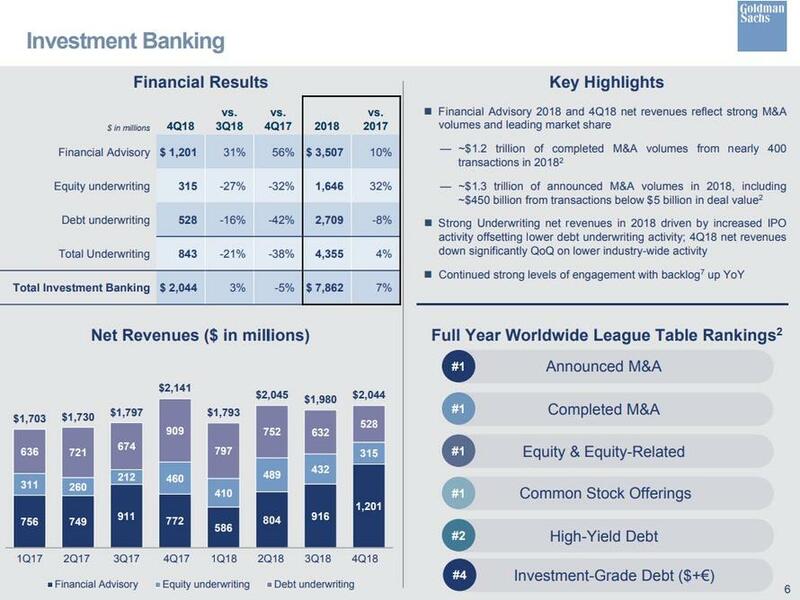 Commenting on the strong IBanking performance, Goldman said that net revenues reflected "strong M&A volumes" with "$1.2 trillion of completed M&A volumes from nearly 400 transactions in 2018" and "$1.3 trillion of announced M&A volumes in 2018, including $450 billion from transactions below $5 billion in deal value." Additionally, "strong Underwriting net revenues in 2018 driven by increased IPO activity offsetting lower debt underwriting activity." The company also noted that net revenues in Q4 were down significantly QoQ on lower industry-wide activity." 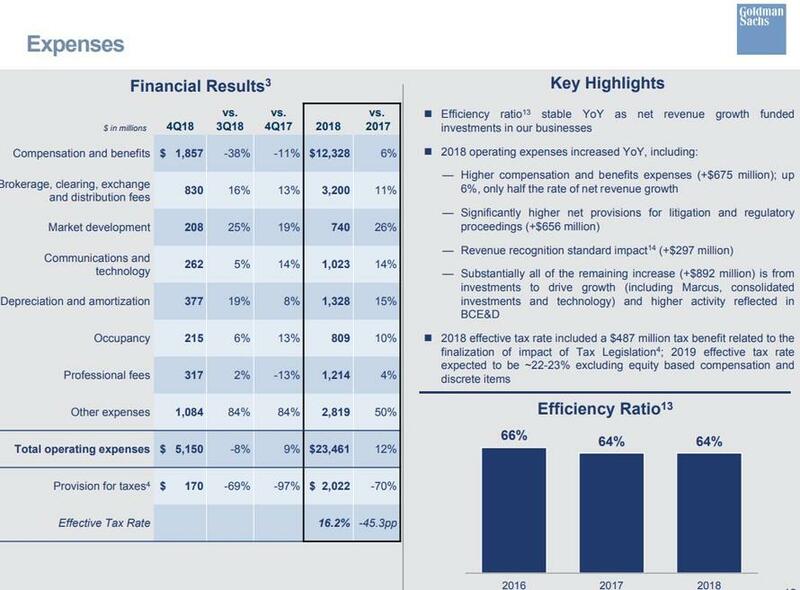 While revenue beat, and were roughly flat Y/Y, operating expenses came in at $5.15 billion in the quarter, in line with what analysts were expecting, if a 9% increase from a year ago, which the bank says reflects "significantly higher provisions for litigation and regulatory proceedings" which are likely related to the 1MDB scandal. Sure enough, provisions for litigation came in at $516 million in the quarter, compared with $9 million a year ago. Also notable is that unlike all other banks which are slashing overhead, Goldman's expenses for the full year rose 12%, with the bank saying that's primarily due to higher compensation costs which are a result of the better operating performance of the firm (although it is quick to note that "higher compensation and benefits expenses (+$675 million); up 6%, only half the rate of net revenue growth"). It also says it faced "significantly" higher litigation and regulatory provisions. For the first time, Goldman The bank has a whole section on provision for credit losses, which came in at $222 million in the quarter, above the $183 million expected, but down from $290 million a year ago. But perhaps the biggest surprise in today's Goldman earnings report is that unlike the Blankfein era, David Solomon has decided to imitate the other banks and has provided a presentation to go along with today's calls. In it, we find that the agenda for today will be Solomon kicking us off with an overview of Goldman's strategic priorities and his macro perspectives on client engagement as well as the much sought after update on 1MDB. CFO Stephen Scherr will then lead investors through the financials and open up the line for Q&A.